My Question: Do you ever use the self checkout at stores? My Answer: Yes. Sometimes. And I must be a glutton for punishment, because 90% of the time it doesn't work right. Never mind the time when a lady who works there totally yelled at me one time. Now on to Friday Follow. I hope you will follow me - let me know that you are, and I'll visit you as soon as I can to follow you. I used to before I had a toddler. 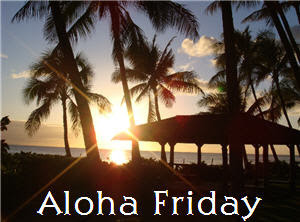 Happy Friday Follow and Aloha Friday! I do use the self checkout but not often. I've had problems too and I always get paranoid it's not checking in and I'll get in trouble. Thanks for linking up this week and best of luck with the cash giveaway! Yes but only if it's crowded and I only have a few items. I use to but, now I'm shopping more at stores that do not have them. yes i like them better, easier and faster. Previously working in a store with self check-outs I know they are a headache. But, alot of it is people don't get the concept. You can't put any kind of weight on the bag rack at all, other than your items. Use it for a couple of items and you are fine. Don't use it for big shops, you will get so frustrated if you do. People have to also realize the cashier is watching several stations and when everyone is holding up their produce asking for the code, instead of looking it up it gets to be a little much. they are a complete waste of time. because you start it and something goes wrong, computer doesn't like what you picked out, then you have to wait for someone to come and correct the problem. may as well just have jumped inline on one of the other registers !!! There is a new Harris Teeter by us ~ a little expensive, so I don't do "full" shopping there (I still am able to use the commissary!!) But I do go for lots of little things and I ALWAYS use the self check-out - it's fun! Yes whenever possible! It's usually faster that way! I was a checker for a year as a second job. So I always use the self checkout! It is so much faster for me. Great blog! Found you on Friday Follow! I would love if you stop by and follow back. I do if the kids aren't with me. It's really tough keeping an eye on the two of them and trying to self-checkout. I love the convenience of it though. I always use the self checkout lanes! Even if every single lane is open. Maybe its for the same reason I'd rather order online than on the phone? Happy Friday! I LOVE your new look!! I hate self-checkouts. They always have problems. Only if the regular lines are really long and I only have a few items. I'm not very comfortable using them. Yes, I always use the self-check outs, unless I have too many items. I figure why should I go to all that work! I have found that you can get in and out in a jiffy at Home Depot and Lowes...hardly anyone uses them? Lot's of great giveaways going on right now!